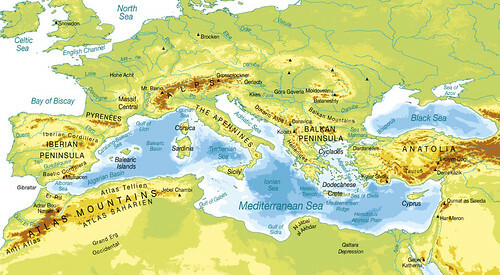 A general overview of the Mediterranean region’s physical geography reveals an irregular, deeply indented coastline, especially in the north, where the Iberian, Italian, and Balkan peninsulas jut southward from the main body of Europe. Numerous islands correspond to isolated tectonic blocks, the summits of submarine ridges, or the tips of undersea volcanoes. The largest islands are Sicily, Sardinia, Corsica, Cyprus, and Crete, and the major island groups include the Balearics off the coast of Spain and the Ionian, Cyclades, and Dodecanese islands off Greece. Apart from the coastal plains and the deltaic zones of large rivers (Ebro, Rhone, Po and Nile), the coastlines are mostly rimmed by mountain ranges. Only the coastal plains from eastern Tunisia to the Sinai Peninsula, bordered mainly by low-lying desert, are free of mountains. In fact, the highest reaches of the main mountain ranges generally mark the limit of the hydrographic basin that drains towards the Mediterranean Sea. These mountain ranges include the Atlas, the Rif, the Baetic Cordillera, the Iberian Cordillera, the Pyrenees, the Alps, the Dinaric Alps, the Hellenides, the Balkan, and the Taurus (Amblas et al. 2004).